But the soul hankers to see the beautiful form of God, and if he cannot do so, he is likely to try to satisfy himself with the beautiful but temporary things to be seen in the material world. Or worse still, in frustration he may conclude that there is no such thing as God or that God really has no form at all. However, actually seeing the form of God in the Ratha-yatra festival can rescue the soul from the perils of materialism and the hopelessness that comes from thinking that God is void or dead. Sometimes people unfamiliar with the meaning of the Ratha-yatra festival think that the devotees singing and dancing with their arms in the air are offering homage to a statue. Indeed, sometimes they condemn the entire celebration as paganism. Or else they hesitate to join the Ratha-yatra parade, for they remember that God is “a jealous God” who commands, “Thou shalt have no other God before Me” and “Thou shalt not worship a graven image.” What about this? Are the Hare Krishna people really idol worshipers? To know for sure, first we must define what idolatry is. Concisely, idolatry is the worship of a material form of God imagined by the human mind. The classic example occurs in the Bible. When Moses ascended Mt. Sinai to receive the Ten Commandments, in his absence the Israelites molded a golden calf and began to worship it as God. This, indeed, was idolatry, for instead of worshiping God, they had worshiped their own whimsical creation. But aren’t the Hare Krishna people also worshiping statues made of metal and wood? To understand what is actually going on in the Hare Krishna temples and the Ratha-yatra parade, first we must think about Krishna, or God (Krishna is a name of God), as a real person. We must overcome false notions that God is impersonal or void, for such ideas arise only from a poor fund of knowledge. A child who sees a satellite floating in space may think that it’s traveling on its own, but the enlightened father knows that great teams of scientists are applying their intelligence and energy to guide the satellite in its orbit. Similarly, a thoughtful human being must know that directing all the greater satellites we call the stars and planets is a supreme intelligence, a supreme person. The cosmos, with its seemingly unlimited wonders, could not have just hatched from some void or impersonal force. Such an idea is absurd. “Force” implies that ultimately a person must be applying the force. We may not know who that person is, but that is no excuse for denying that He exists. Granting, as we reasonably should, that such a person does exist, why should we deny Him a name, form and other personal qualities? We may honestly admit that we don’t know what they are, but to say that what we don’t know about cannot exist betrays a narrow, unreasonable mind. If God is the Supreme Person, the Supreme Father, He must have all the qualities of a person. Otherwise, how could personal qualities appear in His sons? The emanations cannot have more than their source; the parts cannot have more than the whole; the tiny drop cannot have more than the ocean. Just as an ocean of water has the same chemical makeup as its individual drops, the Supreme Living Being must have all the personal qualities found in the innumerable living beings who are part and parcel of Him. Therefore, God must also have a name, form and senses. So if God has a personal form, what is it? Our limited, imperfect mind and senses cannot tell us, for He is beyond them. Indeed, God is beyond the entire universe. (How else could He be its creator?) Therefore if we want to know about the personal qualities of God, we must receive this information from God Himself, through the revealed scriptures. We may also learn from a self-realized saint or spiritual teacher, but the qualification of such saintly teachers—like Jesus Christ, for example—is that they always speak on the basis of the scriptures and refer to the scriptures to support their own words. They never invent anything new. However, although the scriptures of the West consistently speak of God as a person, they give only scanty information about His personal form, qualities and kingdom. If we want more detailed information about God, we must turn to the Vedic scriptures of the Krishna consciousness movement. These are books like Bhagavad-gita, Srimad-Bhagavatam and other scientific scriptures, which were first compiled in writing in India some 5,000 years ago. This is the call of the Krishna consciousness movement: if you indeed want to understand God in His full glory as the Supreme Personality of Godhead, then you must turn to these scriptures, for nowhere else will you find the details of His spiritual name, form, qualities, pastimes and abode. It is to be stressed that these are not imaginary conceptions, like those of a poet or an artist. These are the explicit descriptions of the revealed Vedic scriptures. The Vedic scriptures tell us God’s name—Krishna—and they describe in minute detail His qualities, pastimes, entourage and abode. And most important for resolving the question of idol worship, they describe in detail His form. The forms of Krishna on the Ratha-yatra car and in the Krishna consciousness temples are not imaginary creations. They are fashioned exactly according to the descriptions of the Vedic literature. The Deity is not a whimsical icon. When we see the form of the Deity of Krishna, what we are seeing is the actual form of God. 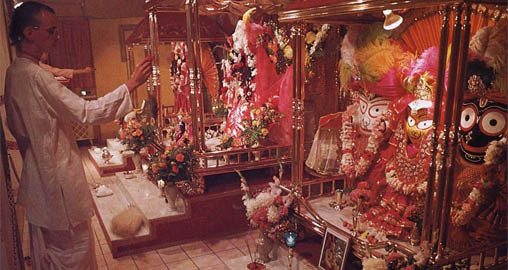 But even if we accept that the Deities in the Krishna consciousness temples accurately represent what God looks like, this still does not explain why the Hare Krishna people worship the form of the Deity as if it were actually God Himself. This is a matter that requires some philosophical astuteness. The reason the Deity is accorded such reverence is that the form of God is God. There is no difference between the form of the Lord and the Lord Himself. On the material platform, a person and his picture, for instance, are different. Seeing a picture of a friend may remind us of that friend, but the picture is only a representation, not the friend himself. Furthermore, in the material world a person is different even from his very body, for the body is matter whereas the person is the spiritual spark within the body. But God, if we accept Him as being fully spiritual, must be free from all such dualities. The Supreme Personality of Godhead and His transcendental form are the same spiritual identity. The Vedic literatures describe that each part of His transcendental body can perform any of the functions of any other part. Thus although with our eyes we can only see, the Lord can not only see with His eyes, but also taste, smell or hear with them. Thus the transcendental form of the Supreme Lord is unlimited and all-powerful. The Lord’s form is eternally transcendental wherever He appears, even in the material world. When an ordinary living being comes to the material world, the material energy subjects him to many limitations. It covers him with a temporary material body that afflicts him with many miseries. Thus he has to get old and diseased and finally die and accept another body. But the Supreme Lord is not under the material laws of nature; He is beyond those laws, just as a king who visits a prison is beyond the laws that govern the prisoners. The transcendental form of the Supreme Lord has all opulence and power. Therefore the Lord has the power to appear in the material world in His transcendental form as the Deity but always remain the same transcendental Lord. We may object that God cannot have a form made of ordinary matter like wood or stone. But we should consider that for the Lord there is no difference between matter and spirit, for the Lord can change spirit into matter and matter into spirit. Everything is God’s energy, and God is all-spiritual. Therefore all of God’s energy is also spiritual. We call it “material” or “spiritual” according to how it acts upon us, but in reality it is one spiritual energy. To draw another comparison, electricity is one single energy, although sometimes it works in a refrigerator to cool things and sometimes in a stove to make things hot. The expert electrician who can master electrical energy can use it to perform either function. Similarly, the Lord, the master of all energies, can turn matter into spirit at His will. Who can stop Him? So even if we accept the Deity as being stone or wood, we must admit that the Supreme Lord has the power to change stone or wood into spirit at any moment. In one sense, the Lord is already present in all stone and wood—as well as everywhere else—because everything is His energy. Wherever God’s energy is existing, God Himself is also existing, just as the sun is present wherever there is sunshine. A fully God conscious person can recognize God’s presence in His energy, and therefore He can see God everywhere. For the benefit of those who are not so advanced, however, the energy of God can be shaped into the transcendental form of God so that even in this material world we can see the transcendental form of the omnipresent Supreme Personality of Godhead. Those who are addicted to the idea of a formless, impersonal God object to the worship of the Deity in the temple. “God is everywhere,” they say. “Why should we worship Him in the temple?” But if God is everywhere, is He not in the temple also? God is certainly everywhere, but we cannot see Him everywhere. We are all eternal servants of the Lord, but we have forgotten our relationship with Him. Therefore the Lord, by His causeless mercy, appears as the Deity in the temple so that even in this world of material forgetfulness we can see Him and revive our eternal relationship with Him. How does the Lord change matter into spirit? He does so when He appears, by the grace of His devotee, as the transcendental form of the Deity. When a pure devotee paints or carves the form of the Deity and calls upon the Lord to kindly agree to accept his humble service, the Lord agrees to do so, provided everything is done according to the scriptural regulations. One’s sincere attitude of service to the Lord and strict adherence to the rules of the scriptures are the essential ingredients that make Deity worship vastly different from worship of an ordinary idol. If the form one worships is merely imaginary, then one’s worship is whimsical idolatry. But if one worships the authorized transcendental form of the Lord with a sincere desire to serve the Lord, and if one strictly adheres to the rules and regulations of the scriptures, his worship is transcendental, and the Lord will certainly accept it. The example is often given of a post office and an authorized mailbox. Because the post office may be far from our homes, the postal officials install authorized boxes in various neighborhoods so that we can use them to send our mail. One can paint any box blue and red and call it a mailbox, but it will have no value. However, when the postal officials install an authorized mailbox, that box is as good as the post office itself. Similarly, an imaginary form of God is nothing more than an idol; but the authorized form of the Lord is as good as the Lord Himself, and the Lord, in His transcendental form as the Deity, will accept the service we render to Him and will also reveal Himself to us more and more. Now, we may see the Deity to be no more than wood or stone, but that is due only to our defective vision. The Lord cannot be seen with our blunt material senses. One has to purify his eyes by seeing through the vision of the scriptures and by rendering devotional service to the Lord. This is the process for developing our spiritual vision so that we will be able to see the supreme Lord. The Padma Purana specifically mentions that we can best begin to purify our senses by purifying the tongue. Of all the senses, the tongue is the most difficult to control. Nevertheless, one can control it very easily by eating food first offered to Krishna and by chanting the holy name of Krishna, as found in the maha-mantra—Hare Krishna, Hare Krishna, Krishna Krishna, Hare Hare/ Hare Rama, Hare Rama, Rama Rama, Hare Hare. This will certainly purify the tongue of even a most materialistic person. And when the tongue is thus engaged in the service of the Lord, all the other senses can also be engaged. The worship of the Lord as the Deity—and specifically the worship of Lord Jagannatha in the Ratha-yatra festival—is an opportunity for us to purify our senses in this way. When the Lord appears before us as the Deity, we can purify our minds simply by thinking about Him. Similarly, we can purify our eyes simply by seeing Him, our ears and tongues just by hearing and chanting His holy names, our nostrils by smelling the incense and flowers offered to Him, and our bodies by standing up to see Him, dancing before Him or bowing down to offer Him our obeisances. 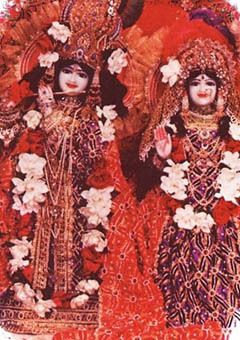 Krishna says in Bhagavad-gita, ye yatha mam prapadyante tams tathaiva bhajamy aham:“As one surrenders himself unto Me, I reciprocate with him.” Thus for one who refuses to accept the verdict of the Vedic scriptures and who therefore considers the Deity a wooden idol, Krishna will remain an idol forever. The scriptures say that such a person is cursed with a hellish mentality. But for one who tries to appreciate the Lord’s presence as the Deity and render service unto Him, the Lord will one day fully reveal Himself.